All the ingredients you need to make our favorite kava kava recipe. 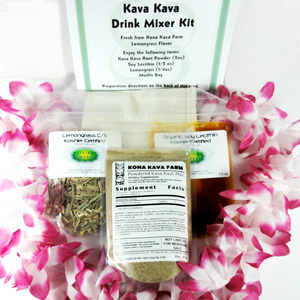 The Kava Kit is a quick and easy way to try kava with the traditional preparation and ingredients. Each kit serves two. Enjoy with a friend! Our kava includes 2 ounces of our favorite Kava Kava root from Kona Kava Farm, plus a palmful of lemongrass, 10 grams (1 tablespoon) of soy lecithin, a 5" x 8" Muslin straining bag, and complete instructions for an enjoyable kava experience. The only thing you have to provide is coconut water, coconut milk, optional pineapple juice, and the blender.